It's hard to believe that in less than a month, I will be traveling back to the Philippines. [pinches self a little too hard] During my visit last Fall, the first since 1987, I promised everyone that I would I never let that much time go by again before making it back. Despite the passage of 25 years, and the myriad ways in which the country has expanded, and my aunts, uncles, and cousins have changed, it was remarkable how familiar everything felt. Never mind that I was born in the States half a world away - I felt "at home" in the Philippines. I felt like I belonged there. And the thing that made me feel most at home was when all of us would eat together. To enjoy the food, of course, but more importantly, to enjoy each other and our presence in each others' lives. Soul food would be no exaggeration. And while I've shared many Filipino recipes here, many of which were taught to me by my late grandmother, today I wanted to share a recipe based on a classic street vendor snack sold on literally every corner, on board jeepneys and buses, and at every open air market. 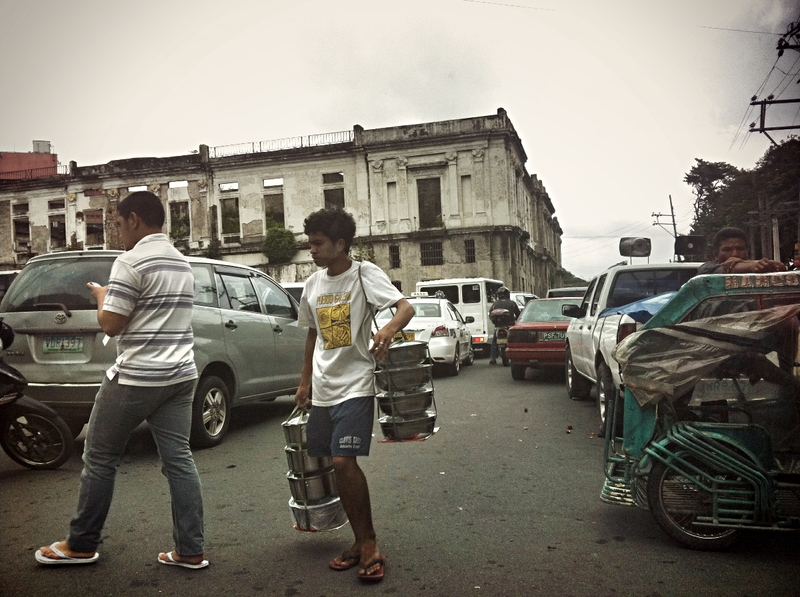 A vendor selling a variety of snacks and meals at Intramuros in Manila. Pritong Mani - got me through many a sugar crash during my visit. My inspiration was deep-fried peanuts and garlic, also known as pritong mani (pronounced prē-tohng mah-nee) - notoriously perfect as an accompaniment to a cold brew. The vendors would rhythmically chant "Mani! Mani!" as they locked eyes with every person that would pass by and I would joke with my sister that it sounded like they were shouting "Money! Money!" They would have a large bucket slung over their shoulder filled with the garlicky, salty, and sometimes spicy, peanuts, and they would use a metal ladle or a steel measuring cup to portion the nuts into little brown paper bags that would quickly spot with grease. The smell always enticed me, and to see the vendors, often children, beam when I would hand them 10 pesos (roughly 25 cents) always warmed my heart. So today, I offer my version of oven-roasted pumpkin seeds with garlic, a considerably healthier alternative to the Filipino street food that will still rock your tastebuds and inspire you to sigh with satisfaction. 2. Combine pumpkin seeds, garlic, and oil in bowl and mix well, making sure all the seeds are coated. The amount of garlic is entirely up to you - just avoid chopping the garlic too finely, as it may burn and turn bitter. 3. Line you baking pan/dish with parchment paper and spread the oiled pumpkin seeds and garlic in a single layer. Crowding the seeds will can prevent the seeds from becoming as crisp and cooking evenly, so be sure to use a baking dish/pan that is large enough. 4. Place on middle rack in oven and bake for 20-25 minutes, turning the seeds roughly midway through to rotate the outermost seeds to the center and vice versa. 5. Remove from oven when finished - many seeds and the garlic pieces will now have golden brown edges and it will be very aromatic - and sprinkle with salt and desired spices while still hot and turn once more. 6. Allow to cool at least partially and then serve and enjoy. I'll admit it - I added more garlic after this shot. Fresh from the oven, seasoned, and smelling all kinds of wonderful. If you'd like perspective on just how much healthier this recipe is compared to those for pritong mani, compare the single teaspoon of oil that I use to the 3-4 cups of oil that are used for deep frying. While I used to be a sucker for deep fried anything back in the day, now I cannot even consider it as it just seems so excessive and wasteful to me. And pumpkin seeds, beyond being tasty and a great alternative to those with a peanut allergy/sensitivity, are a good source of zinc, vitamin E, antioxidants, and healthy fat. But now I understand that good recipes are those that honor and respect the ingredients, that are efficient, relatable, and inspired, and ultimately a good recipe will result in something delicious that can be shared to inspire connection, gratitude, and love. And this recipe, inspired by the nostalgia of Filipino street food and the sense of home that I am so looking forward to experiencing once again, does exactly that. 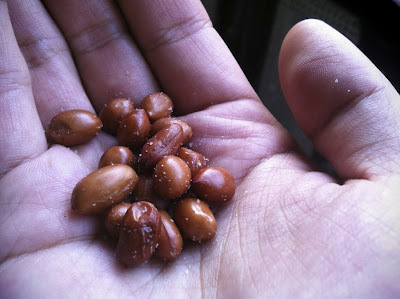 We had this exact food (peanut version) served up with cold cerveza in Oaxaca, Mexico. Puro yummmm. Puro yummmm, indeed! Ah, the interminglings of Filipino, Spanish, and Mexican culture. We should make this together one day!